Kian Preston-Suni is a third-year medical student. In a televised ceremony on the White House lawn earlier today, Courage the turkey received a full presidential pardon and an engraved plaque. “This young turkey has shown us the true meaning of the American dream. We are stronger together than we are divided. America. Today, on behalf of the American people I grant Courage the turkey, at least 364 more days of life,” proclaimed President Barack Obama. The recently embattled turkey has fought allegations of infidelity and bribery, only to emerge redeemed and un-basted on this cold Thanksgiving morning. President Obama’s pardon came just hours before Courage was to be executed and served to international dignitaries. After several minutes of resounding praise, Courage was escorted off the stage. Attention quickly turned from the bird as guest speakers repeatedly noted the importance of the day’s events. “Today is an historic day. This is not just a victory for Courage, not just a victory for his fowl brethren, but a victory for black presidents everywhere,” proclaimed an ebullient Rev. Jessie Jackson. 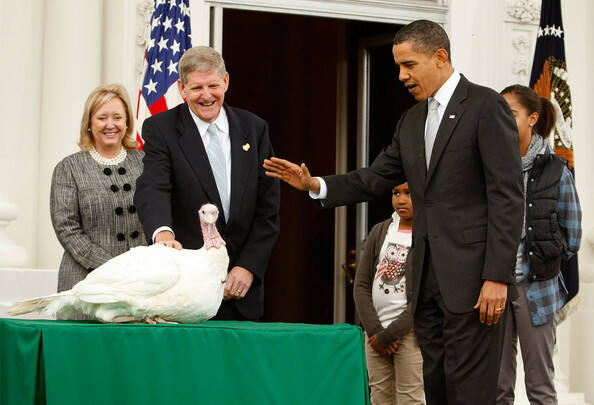 Despite repeated attempts, no black president has ever granted a turkey pardon. Considered the most significant pardon by many analysts, a pardon of this level has never escaped stagnation by the legislature. A duck pardon issued in 2002 by South African President Thabo Mbeki was widely regarded as the greatest black presidential bird pardon, until today. Emotions ran high at the Post-Pardoning Ball, where record attendance by both Black and White presidents required overflow seating in the nearby National Mall. Nancy Reagan officiated over the intensely contested annual Black presidents versus White Presidents pander-off, which she declared a draw. Word count analysis shows the words “founding fathers”, “greatness”, and “the” were the words most commonly used by both sides, coming in at 76, 18, and 13, respectively. A Rasmussen poll showing 64% of Americans approve of the turkey pardon doesn’t capture the extreme discontent that some feel. Commentator and news analyst Glenn Beck has begun a campaign to discredit President Obama’s pardoning. “I have undeniable proof that tens, if not hundreds of black presidents have already pardoned turkeys,” explained Beck, with tears in his eyes. Beck’s “Giblet Baggers” may be angry, but they have less cause for despair than some. Most Washington insiders agree, the biggest loser in today’s celebrations was John McCain. After his execution, Courage, an outspoken organ donor, planned to give his beak and talons to the next turkey in line on the donor recipient list.